Easily track time worked by your employees on your projects. OroTimesheet allows you to keep track of the time spent on each project by your employees. It also allows you to manage your timesheets, project costs, expenses, budgets and invoices as well as to maintain time banks of your employees. "We are very, very happy with OroTimesheet, it's my best buy ever! ...I evaluated for more than a year almost everything on the market and yours is by far the best solution I came across." "We made extensive research on timesheets before we chose OroTimesheet and I must say that the rest of what we have seen was not worth it's money." We are proud to provide free support without any additionnal fees. Indeed, there is no extra fees to pay when subscribing to OroTimesheet. OroTimesheet is constantly being updated for the complete satisfaction of our customers. Who uses OroTimesheet? From small companies to major corporations, OroTimesheet can help you keep track of your costs, profits and worked time for each of your projects. 100% Web : OroTimesheet is a cloud web application. 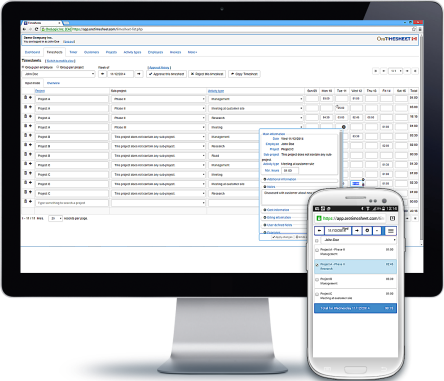 You can enter your timesheets in OroTimesheet from a desktop computer, a tablet or a smartphone. OroTimesheet is always available, 24 hours a day, 7 days a week. You have nothing to install on your side. A simple internet connection is enough to use OroTimesheet. Manage project costs and billing : In addition to track time per project, if needed, OroTimesheet allows you to manage costs and billing. Cost and billing rates are customizable in several ways such as per projet, per employee or using more complex cost and billing rules. OroTimesheet can also manage fixed rate projects. Easy setup : A wizard allows you to configure the software in less than 2 minutes. You can even select your logo and it will be automatically displayed on your invoices. Maintain time banks for your employees : OroTimesheet allows you to maintain time banks (accumulated time, vacations and sick) for each of your employees. In some cases, employees and employers will choose to keep overtime in a bank. Several configurable reports included : The option "Quick Reports" allows you to select a report (a dataset), select fields to display, select sort and group order then define report criteria to get only data you want. You can save your custom report for future use and even share reports with other users. All reports can be exported in several file formats including Microsoft Excel and Open Document spreadsheets. Create your own custom fields : Customizable fields can be defined in most of the modules of OroTimesheet. These user-defined fields are used to enter and manage information specific to your company. User defined fields can take several forms, such as an edit box, a checkbox, a dropdown list, radio buttons, etc. Timer option : A time option is also included with OroTimesheet. This option allows to record time spent on projects. Then, this time is automatically recorded into your timesheet. You can create an account then use OroTimesheet absolutely free for a 45 days trial period. There is no limitation to the software during the trial period. After having evaluated OroTimesheet, if you want to continue to use it, you can subscribe for as low as 5.99$ CAD per employee per month or less! Refer to section Pricing at OroTimesheet.com for more details. Connect to your account then access the section Help and support to consult latest documentation available. As needed, get also technical assistance to configure or use OroTimesheet. This assistance is absolutely free and there is no extra support or service or maintenance contract to pay. Simply connect to your account then access the section Help and support to contact us.